Here’s your complete guide to the captivating Pembroke Welsh Corgi! These dogs get a lot of press. That’s not just because they’re roly poly and darling, but also because the Queen of England, Elizabeth II, loves them. If you’re thinking of getting one, we think you’ll find it easy to adore these stout-legged, sweet pups. But before you realize you can’t resist them, you’ll need to know a few things. What are Corgis like to live with? What kind of requirements do they need to live a full and happy life? Are you ready to share your home with a Pembroke Welsh Corgi? Let’s find out! Corgis have a magical background. Legends say that these dogs were used by fairies and elves to pull coaches, work their cattle, and as a riding steed. We do know these dogs have been used as herders, guardians of farms, and as family companions in Wales since the tenth century. They may be descended from the Vallhunds- Swedish cattle dogs- or their ancestors may be the Flemish Schipperkes and Pomeranians brought into Wales by Flemish weavers, invited to Britain by King Henry I in 1107. In the 1920s, Corgis became recognized as a breed by the English Kennel Club. And in 1934, Pembroke and Cardigan Corgis were recognized as separate breeds. In 1934, the American Kennel Club also recognized both breeds. The Corgis from Cardiganshire are an older breed, distinguished from the Pembrokeshire breed by larger, rounded ears, smaller eyes, and a non-docked tail. These dogs are also slightly heavier-boned. Today, Pembroke Welsh Corgis are the 18th most popular breed in the U.S. The word “Corgi” supposedly means “dwarf dog” in Welsh. What Do Pembroke Welsh Corgis Look Like? Pembroke Welsh Corgis are low-set, strong, sturdy dogs. They have a very distinctive look as a result of their long bodies and short legs. The head of a Welsh Corgi dog is fox-like in shape and appearance. They have wide, flat skulls and erect, bat-like ears that can look large, especially in Welsh Corgi puppies. The long bodies provide overall balance, and Pembroke Welsh Corgis have deep chests. The coat of the Corgi is medium length, with a short but thick water-resistant undercoat and a longer and coarser outer coat that lies flat. Their hair is usually straight or wavy. Generally, Pembroke Welsh Corgi colors include red, sable, fawn, black, and tan, with or without white markings. Pembroke Welsh Corgi tails are docked. 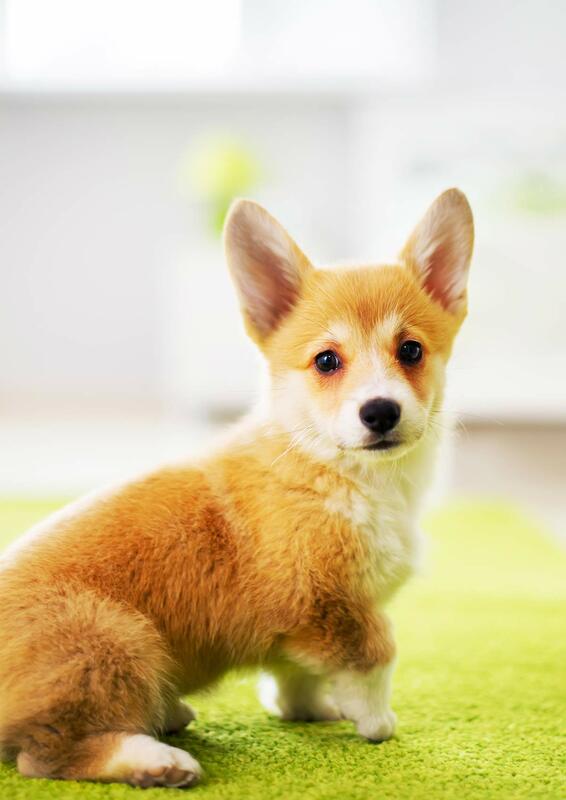 If you’re planning to show Corgis, “fluffies” – a long coat with feathering at the ears – are considered a fault. So are “whitelies” – white dogs with dark/red markings – and “bluies,” where the colored portion of the coat has a bluish cast (often paired with light eyes). Mismarks include “self” colors with any white on the back between the withers and tail, on the sides between the elbows and back of the hindquarters, or on the ears. Black with white markings and no tan is also a mismark. Corgis do shed daily, and more in season, so they require consistent grooming. How Do You Groom a Welsh Corgi? A Pembroke Welsh Corgi should be groomed daily because these dogs are shedders. Using a comb and a slicker brush can help control the shed hair. Use both these tools each day. This shouldn’t take long – just a few minutes a day should help control the flyaway hairs. Spray the coat with water to prevent airborne hairs. Especially during the shedding season (late spring, early summer), give your Corgis baths to loosen dead hairs, then brush them. Raking out the coat can help strip the undercoat, which is shed during this season. Don’t forget to cut your dog’s nails! Their ears should also be regularly checked. How Much Should My Pembroke Welsh Corgi Weigh? An adult Corgi will weigh about 27-30 lbs. They are like big dogs in small packages – very compact and muscular! But they are also well-balanced. Corgis aren’t coarse or heavy-boned. For showing Corgis, the preferred weight is about 27 lbs for males and 25 lbs for females. Dogs in show condition should have a nice medium bone structure. How Tall Will My Pembroke Welsh Corgi Grow? Height for dogs is usually calculated from the ground to the withers. In Corgis, height for adult dogs is usually about 10-12 inches. Of course, the best way to figure out the potential height of your Pembroke Welsh Corgi is to look at his parents and grandparents. A peek into the genetic line can give you a more precise range of height possibilities. Some people are trying to breed Miniature Corgis, but their health is currently a topic of much debate. Many consider the Welsh Corgi one of the most agreeable of the small house dog breeds, as they are sweet and affectionate without being needy. These dogs are bright, curious, and sensitive pups. As they are used to herd cattle (by nipping at their feet), they are relatively fearless and bold, too. Pembroke Corgis are active and lively little guys with a ton of stamina. They have sharp senses and make good watchdogs. Corgis are not aggressive. They’re outgoing and loyal. Do Pembroke Welsh Corgis Bark Much? As good guard dogs, Corgi dogs do bark to alert humans. They have quite a loud and powerful bark for their size because of the depth of their chests. They may also bark if they’re home alone or bored. If they don’t get enough exercise, you’ll hear them loud and clear! The good news is, they’re also very trainable, so this is something you can work on. Training is beneficial for all dogs, and Corgis are very responsive to training because of their energy and willingness to please. Since they are also quite independent, training may help curb this tendency and keep Corgis out of trouble. Remember they are a sensitive breed, so positive, reward-based training works well. Training can help deepen the owner-dog bond, too. Corgis are on the small side, but they’ve got big-dog qualities, so socializing them with people and other dogs is good. You may also have to teach them to walk up and down stairs because of their long bodies. Is A Pembroke Welsh Corgi A Good Pet? Welsh Corgis can definitely be good pets, thanks to their sweet temperaments and loyal natures. Just make sure that you socialize and train them well! How Much Exercise Does My Welsh Corgi Need? As active and energetic pups, Corgis do need exercise. They like both long and short walks, jogging, and other pursuits. They may also benefit from some agility training, thanks to their herding nature. As a short-legged breed, though, Corgi exercise needs are moderate. Make sure to provide plenty of toys for mental and physical exercise, such as balls and rubber rings. Are Corgis Good with Children? Yes, they are, but some training might be required with Welsh Corgi puppies to curb natural herding behavior where it affects small children. Use common sense when introducing Corgis to children and also pets. These dogs were used on the farm for ratting and many other duties, so they may view kids and other pets as part of the herding job at first. You’ll have to train them early to curb this type of behavior. Corgis aren’t very tall, but they can herd cattle by nipping at their heels, so they might try this with kids. Breeders estimate the average lifespan of Pembroke Welsh Corgis at about 12-13 years. White Corgis are often fortunate healthwise; there are some medical conditions of concern in this breed. One thing you should know is that Pembroke Welsh Corgis are considered to be a true dwarf breed. This means that they are built proportionally like bigger dogs despite their smaller size. The short legs that Corgis are known for is from a phenotype called chondrodysplasia, which can also be seen in the Basset hound. Some of the conditions that Corgis may face are listed below. Hip dysplasia is an umbrella term for conditions that affect the joints of dogs. The condition leads to osteoarthritis in the affected joints, and eventual loss of use. This condition can sometimes be managed for a time with diet and controlled exercise as well as drug therapies, but it is progressive and non-reversible. You may know it from bigger dogs, but the chondrodysplasia that is bred into Corgis causes hip laxity and issues that lead to dysplasia. Corgis may inherit issues in the eyes like progressive retinal atrophy, cataracts, corneal ulcers, blocked tear ducts, conjunctivitis, epiphora, and trichiasis. These may eventually lead to blindness. Such diseases and resulting blindness may be managed, with care. This is an inherited form of thrombocytopathia, or qualitative platelet defects. These defects cause issues in platelet function, including adhesion, aggregation, and release. It is basically a bleeding disorder especially commonly diagnosed in Corgis. If your dog has prolonged bleeding despite normal platelet counts and clotting functions, this might be a cause. Dogs with this disease must not play roughly with other dogs due to the excessive bleeding, but the condition can be managed, sometimes with transfusion therapy. Depending on which studies you read, one of the biggest causes of Corgi mortality is from heart conditions. Corgis may experience heart murmurs, primary hypertrophic cardiomyopathy, right-to-left congenital cardiac shunts, and persistent ductus arteriosus (the opening of two vessels leading from the heart), among other conditions. Each of these conditions will have different management regimens and prognoses that can be overseen by your veterinarian. While many studies do not specify the type of cancer, studies of Corgi and purebred mortality show that cancer is usually one of the top three causes of death for this breed (cardiac issues, cancer, and old age are also top reasons for mortality). Dogs that suffer from degenerative myelopathy (DM) in their spinal cords experience progressive and chronic issues in their pelvic limbs, which can lead to paraplegia and incontinence. Vets may prescribe a drug treatment regimen, but the long-term prognosis of DM is poor. Many dogs diagnosed with DM end up being euthanized within six months of the time of diagnosis. Other issues that Corgis may be prone to are reproductive issues (irregular heat cycles, absence of testes, infertility, uterine infections), elbow dysplasia, neurologic disorders, gastrointestinal issues, and autoimmune diseases. We recommend genetic testing for the above conditions so you know how healthy your puppy is. Should I Buy A Pembroke Welsh Corgi Puppy? To be honest, Corgi puppies are the cutest – but maybe not always the healthiest, given the chondrodysplasia bred into them over generations. Responsible breeders will do their best to safeguard the best genetics for future generations, but Corgis are a bandwagon breed – lots of people suddenly want them. If you’re looking for a small dog breed, a Miniature Schnauzer, Miniature Poodle, or Border Terrier might also meet your needs. However, if you have your heart set on a Corgi, we get it. You’ll have no trouble finding Pembroke Welsh Corgi breeders. Just make sure to look over health information and genetic testing results before you fall in love. If you’re looking for a Welsh Corgi adoption, Pembroke Welsh Corgi rescues that are breed-specific do exist. You won’t necessarily get information about a pup’s parents, but testing is still important! Corgis are cute, and with a little training, they make fine, affectionate family pets. What do you think? Let us know in the comments. American Kennel Club, Pembroke Welsh Corgi. Adams, V. J. et al (2010). Methods and mortality results of a health survey of purebred dogs in the UK. Journal of Small Animal Practice, 51. Coates, J. R. et al (2008). Clinical characterization of a familial degenerative myelopathy in Pembroke Welsh Corgi Dogs. Journal of Veterinary Internal Medicine, 21. Ekenberg, V. Genetic parameters affecting leg length, leg weakness, hip- and elbow conformation in domesticated dogs, in comparison with pigs. Sveriges lantbruksuniversitet. Karbe, G. T. et al (2012). Radiographic hip joint phenotype of the Pembroke Welsh Corgi. Veterinary Surgery, 41. Kolm, U. S. et al (2006). Plexogenic pulmonary arteriopathy in a Pembroke Welsh Corgi. Journal of Small Animal Practice, 45. Marks, C. A. (1993). Hypertrophic cardiomyopathy in a dog. Journal of the American Medical Association, 203. Moore, F. M. and Thornton, G. W. (1983). Telangiectasia of Pembroke Welsh Corgi Dogs. Veterinary Pathology, 20. Pembroke Welsh Corgi Club of America, Inc. Genetics & Health Issues. Peterson-Jones, S. (2006). Advances in the molecular understanding of canine retinal diseases. Journal of Small Animal Practice, 46. Szabo, S. D. et al (2007). Evaluation of a circumferential femoral head osteophyte as an early indicator of osteoarthritis characteristic of canine hip dysplasia in dogs. Journal of the American Veterinary Medical Association, 231. The Kennel Club. Report from the Kennel Club British Small Animal Veterinary Association Scientific Committee: Summary results of the purebred dog health survey for the Welsh Corgi Pembroke breed. Woody, B. J. (1992). Clinical approach to the diagnosis of diseases and disorders in pets and domestic animals sometimes mistaken for anticoagulant toxicosis. Proceedings of the Fifteenth Vertebrate Pest Conference.